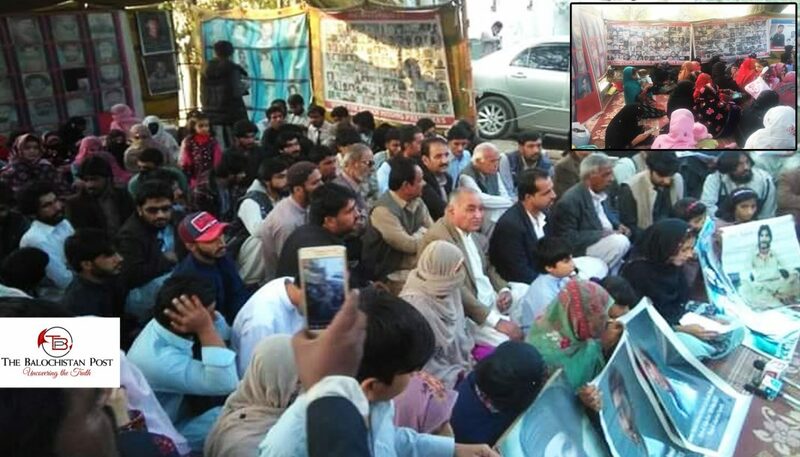 Missing Naseer Baloch’s family has also joined the protest camp of missing persons. According to details received by The Balochistan Post, family of Naseer Baloch has joined the protest camp of Voice for Baloch Missing Persons (VBMP) in Quetta capital city of Balochistan. The camp was initially set up by Voice for Baloch Missing Persons, an organization of family members of the victims of enforced disappearances, ten years ago. Seema Baloch, sister of missing Shabir, and Zarina Baloch, Shabir’s wife, joined the camp 9 days ago and they plan to stay there until their loved ones are not released. In a press conference today, Zubaida Baloch, wife of Naseer Baloch said, “my husband along with Hassam Baloch, Sanaullah and Rafiq Baloch were abducted from University road in Karachi city by Rangers and intelligence agencies personnel on 15 November 2017”. VBMP camp was visited by a leader of Balochistan National Party, Agha Hassan, Baloch National Movement’s Doctor Hayee, Pashtun Tahafuz Movement’s Mullah Bahram and many other political activists.